OK, I know I am jumping back and forth in time, but this seems to be the only way I can stay current and play catch up at the same time. I have been stationary for the last nine days at my friend Carol’s place in Bellingham, Washington. The weather has been great for the northwest, sunny, mid to high 60s and 40s at night. OK, it is a little bit too cool for me, but I take that any day over rain. I have switched from four wheels to two wheels, biking around town. Reminds me of back home in Hamburg where I used to bike everywhere. It is nice not to haul the camper around for a while. This is my time to relax and not to do much of anything. Recharge time, five months on the road and 15,000 miles have left me just a bit tired. Playing with Carol’s son Sidney, roaming around town, meeting new people, seeing old friends, and sitting around the fire pit in the evening, that’s pretty much all I have been doing. I am still hoping to catch up on my writing, keep your fingers crossed. Oh yah, I have been eating corn on the cob! 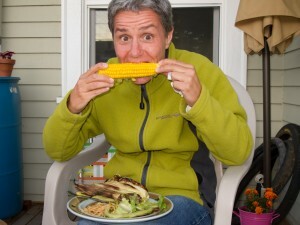 If you know me, you know that corn is the number one vegetable on my do not eat list and I do love my veggies. I tried a variety of corn in the past, white and yellow, and never liked any. I am really eating corn! This fresh Washington corn is super sweet and tender, yummy. 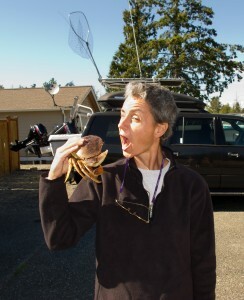 Another culinary experience has been eating fresh, fresh Dungeness crab right out of the shell. 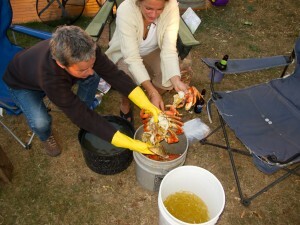 Sitting by the fire and just cracking away and eating crab that was caught that day. A friend of Carol’s took us out on a boat crabbing. Basically, we watched him pull in the crab pods with the catch. No sitting around for hours waiting for something to bite. You need a fishing license to go crabbing and you are only allowed to bring in five crabs per license per day. 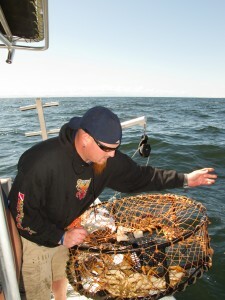 The crabs you keep need to measure at least 6 ¼” across the back, that’s pretty big. We brought back 20 crabs and several of them measured more than the required 6 ¼”! Back on dry land it was time to clean and cook the crab. Not a very pleasant affair. I couldn’t bring myself to smashing in the crabs brain and than clean out its guts, sorry. I just like to eat them and rather not know how they end up on my plate. However, I did manage to clean a cooked crab. One of the crabs I had yielded enough meat for three crab cakes. Unfortunately, I didn’t have a recipe. I am planning on driving up to Vancouver this week, only a 60 mile drive from here. After that I hope to make it to Montana before it gets really cold. I know you guys in the east are still sweating, but out here it is almost fall. I prefer not to get stuck in any snow storms. From Montana I am hoping to make it through Utah to Bryce and Zion, even there the temperatures are already hovering around the 40 degree mark at night. That is a very long drive. Does anyone have any suggestions where to spend the winter? Not Florida, please. What a great way to take a break from all of the driving you’ve done! Hmm. I’ll bet AZ would be nice for the winter, but you already went through there, right? I agree with you on not wanting to kill the crabs but wanting to eat them! How fun to go out on the crab boat, though. yeah, the boat ride was great, a little choppy, but I like it that way. AZ campgrounds are very expensive. Have a good Labor Day.